Need a dictionary tool that works equally well on a Linux desktop and Android devices? Consider Aard dictionary. This is a rather competent dictionary tool that can handle humongous references like an offline version of Wikipedia with aplomb. Aadict can also manage multiple references and dictionaries, so you can look up a word in multiple sources at once. The application uses its own aar format, and the project's website offers tools for compiling dictionaries. But before you get your hands dirty building your own .aar files, you might want to check the selection of ready-made dictionaries, which include the ever-popular WordNet dictionary, an assortment of Wikipedia files, Wiktionary dictionaries, and much more. 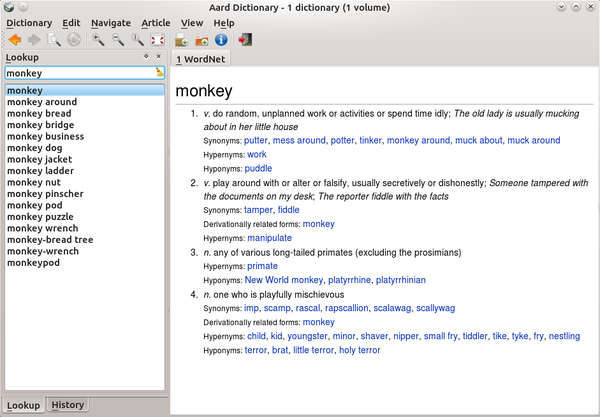 Aard Dictionary binaries are available for Ubuntu and other platforms. Alternatively, you can install Aard Dictionary from source. To do this on Ubuntu, install the python-pyicu package, grab the latest source code release from the project's website, and unpack the downloaded archive. Switch to the resulting directory in the terminal and execute the sudo python setup.py install command. You can also launch Aard Dictionary without installing it using the run.py script. Once the application is up and running, press the Add dictionaries button to add individual dictionary files, or use the Add dictionary directory button to point Aard Dictionary to a directory containing dictionary files. Type then the desired word in the Lookup field to view the results from the added dictionary files. The Android version of Aard Dictionary is available on Google Play. During the first run, the app automatically scans the default locations and adds the found dictionary files. The app's interface is bare-bones, but it gets the job done.